The development team at Numato Lab has created the Aller Artix-7 FPGA Board with M.2 designed for development and integration of FPGA based accelerated features into other larger designs. Thanks to its standard 2280 M.2 form factor M-key slot the development board can be used with laptops, desktops, and servers. Aller features a Xilinx Artix-7 100T FPGA, “the second-most powerful FPGA in the Artix-7 family” and has been targeted at developers experimenting with PCI Express based FPGA designs using simple and cost-effective hardware. 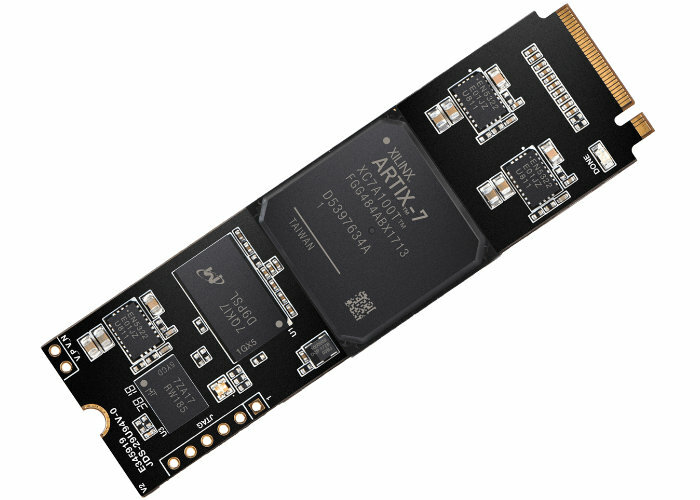 The Artix-7 100T FPGA features ~101K LUTs, ~126K Flip-flops, ~600KiB Block RAM and 240 DSP slices making it very suitable for acceleration applications. ~ Featuring an onboard Trusted Platform Module (TPM) IC means Aller users can completely offload their security sensitive computations to the FPGA. The Aller Artix-7 FPGA board is now available for purchase direct from the Numato Lab online store for an introductory price of $399.95 per unit with volume discounts available if required.